Nuclear power remains the only near-term scalable, low-carbon energy source capable of replacing fossil fuels. Nuclear energy needs are projected to double by 2040, demanding to close the nuclear fuel cycle. Reprocessing and recycling the spent fuel helps in exploiting the full potential of nuclear power and maximizes resource utilization. It could also lead to increased public acceptance of nuclear energy in general by highlighting that such advanced fuel cycles not only recycle spent fuel, rather than leaving it in storage for future generations to deal with, but also remove the long-lived, highly radiotoxic radionuclides that would otherwise end up in geological disposal facilities. However, there has been opposition over the safety and security of nuclear facilities and materials with much of the controversy stemming from the vast amount of legacy tank wastes and the required decommissioning/refurbishment of more than 400 reactors, built in the 1970s and 1980s, presenting a significant safety and environmental challenge. However, the diversity of waste streams, with the elements spanning the entirety of the periodic table, poses a grand challenge for safe handling of radioactive waste and effectively recover and reprocess fissile uranium and plutonium. One troublesome radionuclide is technetium-99 (99Tc), a considerable fraction of which occurs as pertechnetate, TcO4-. This species, with a long half-life of 213, 000 years, is highly mobile in groundwater and biological systems, leading to a possible problematic spread of radiotoxic material following containment breaches. Also, the volatile nature of some 99Tc compounds (e.g., Tc2O7), generated during high-temperature vitrification of the nuclear waste, makes 99Tc problematic in the off-gas system design for vitrification facilities. To this end, 99Tc management is essential both in terms of ensuring safe disposal of radioactive waste from power generation, minimizing the off-site migration of the contaminated groundwater, and assisting in cleanup efforts of legacy waste sites, yet it remains an unmet challenge. Given that TcO4- is larger and has lower hydration energy than most other anions encountered in tank waste, there is a natural bias toward exchanging TcO4- preferentially over the other anions. Therefore, ion exchange is considered the most viable method to sequester TcO4- from the bulk waste stream. However, due to the overwhelmingly high concentration of competitors, such a natural bias is not enough for efficient elimination of this contaminant of interest. Also, the low density of exchangeable sites and insufficient stability of the traditional ion-exchange materials compromise their uptake capacity and long-term high-performance operation. Therefore, sorbent materials designed for such a purpose must be engendered with an exceptionally high enthalpy of adsorption for the target species. Rather than relying on a single direct interaction, the cooperation of multiple functionalities is an emerging strategy for adsorptive materials design to achieve this requisite affinity. Figure 1 | Anion nanotraps for TcO4- removal. 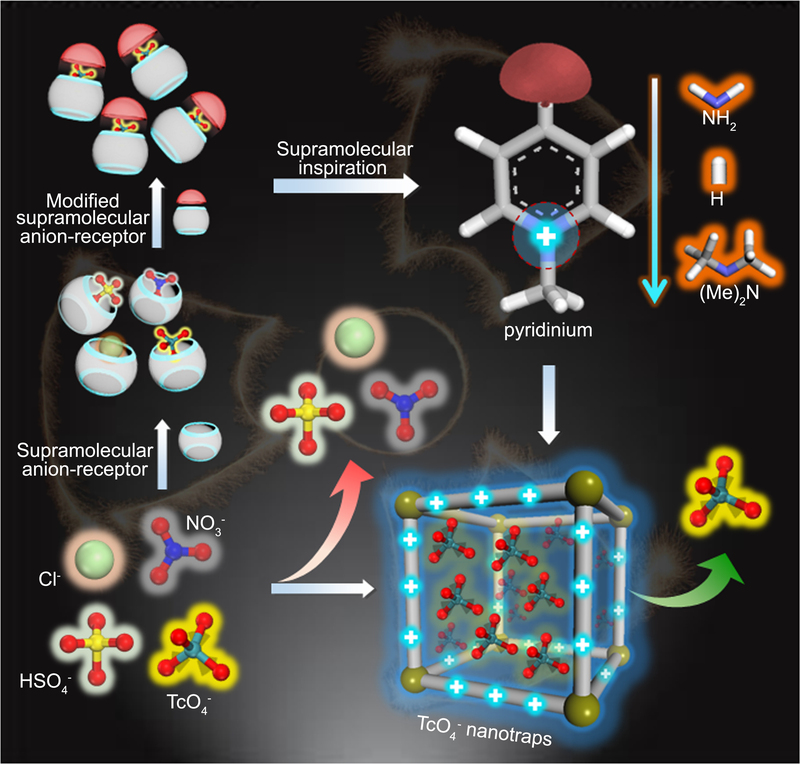 Illustration of optimizing pyridinium based anion nanotraps for TcO4- recognition inspired by supramolecular technology. As an elegant example, supramolecular techniques have been utilized to engineer cations with intriguing properties that display particular innovation and hold promise as potential “game-changing” technologies in the field of target ion extraction. While success was achieved using these receptors in the context of a classic liquid-liquid extraction approach, to meet the challenges posed by the immense volumes of wastewater, sorbent materials would allow for an increase in operational ability. With these in mind, we were motivated by the exploration of porous organic polymers (POPs) for this ambitious task. We describe that the affinity of pyridinium-based anion nanotraps toward TcO4- can be altered by modifying the local environment of the direct contact site. Systematic control of the substituted group allows the resulting anion nanotraps to combine multiple features as ideal pertechnetate scavengers with exceptional performances, substantially overcoming the long-term challenge of TcO4- segregation under extreme conditions of super acidity and basicity, strong irradiation field, and high ionic strength. Furthermore, to improve the uptake capacity and efficiency of the resultant anion nanotraps, porous adsorbent materials were constructed by the functional pyridinium moieties alone, to conserve a sufficiently high density of accessible exchange sites. The best material constructed by functionalized 4-(dimethylamino)-1-methylpyridin-1-ium chloride, exhibited the highest sorption capacity together with unprecedented extraction efficiencies after a single treatment from conditions relevant to the used fuel reprocessing solution in 3 M nitric acid (97%), used nuclear fuel (Hanford tank wastes, 95%), and legacy nuclear wastes (Savannah River Sites, 80%). This work shows that a subtle interplay between various functions in the adsorbent, in this case, incorporation of a distinct functionality on a cation moiety-would be used to obtain an optimally performing adsorbent. Given the fact that ion exchange often follows a similar mechanism, we expect that the trends discovered here will also be of high relevance for many other sequestration processes, such as coordinative binding.